Poor Will has to accompany to places like Class 302, Fluff Ice, Blockheads and Pa Pa Walk and watch me eat delicious shaved snow. Because he’s vegan, places like those don’t have much in the way of cold desserts for him. That’s why when I read about Snow LA Shavery, I knew we had to visit. Fluff Ice claimed to have non-dairy shaved snow, which one would think is vegan, but what they call non-dairy still contains dairy, if you ask to read the ingredients list on their blocks of shaved snow. Luckily, Snow LA Shavery, the K-town shaved snow spot is more accurate with their non-dairy shaved snow — going as far as calling it vegan. 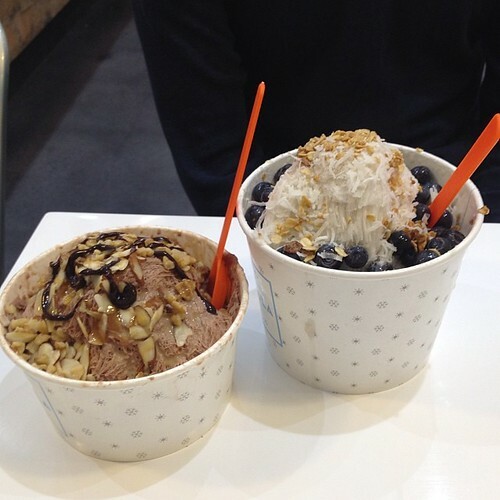 Their banana snow cream is a creamy almond-milk based shaved snow with a lot of banana flavor. Adding the banana was a smart choice because it gives frozen vegan stuff that a rich creaminess without relying on dairy. I got the chocolate shaved snow and it was fantastic. A rich, chocolatey flavor that wasn’t too sweet and was very light and fluffy in texture. I got mine topped with a combination of dulce de leche and chocolate syrup as well as some walnuts and almonds. It was perfect. I like that the place has the self-serve toppings bar, like the frozen yogurt shops so that you’re free to add as many or as few toppings as you want. They weigh it when you’re done to calculate the total price. On the one hand, I’m sad that Snow LA Shavery isn’t in the SGV and on the other, it’s a good thing it’s a further drive away. If it were closer, the temptation to eat shaved snow all the time would be too hard to resist. I went to A-Won a few weeks ago. Though I enjoyed the massively large bowl of sashimi salad, I wasn’t impressed. I went back last week with the lovely Jessica of eat.sip.chew and we both ordered the al bap. I loved it. 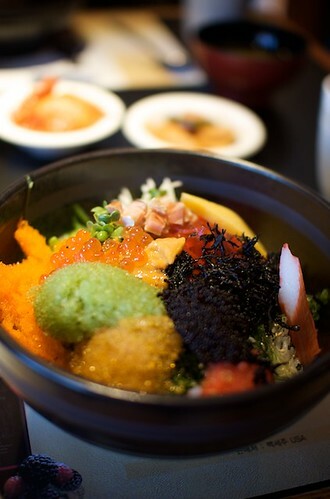 The al bap at A-Won is a gigantic bowl of rice topped with plentiful helpings of fish roe, uni, seaweed, preserved fish, pickled radish, and a few other treats. It was a fantastically colored flavor party in my mouth. The eggs popped delicately between my teeth and every mouthful was delightfully decadent. I should have taken Jonathan Gold’s word the first time when he recommended the al bap in his LA Weekly writeup of it, but for some reason, I ordered something different my first time there. I’ve learned my lesson. From now on, it’s al bap all day long at A-Won. Last week, I was craving sushi, but not just normal sushi. I wanted something different. Enter A-Won, a Korean owned Japanese restaurant in Ktown. 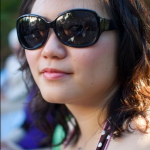 It also helped that I was working from home that day and it was only a few minutes’ drive away. Upon entering, I noticed that the restaurant was bigger than I expected. There were semi-private booths, tables, and of course, a sushi bar. Being that I was alone, I chose to sit at the sushi bar where several chefs were busy tending to the start of the lunchtime rush. 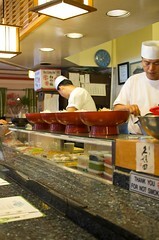 One thing you’ll notice at A-Won is that there are lots of big bowls of food going around. These bowls were super-sized chirashi and sashimi salad. 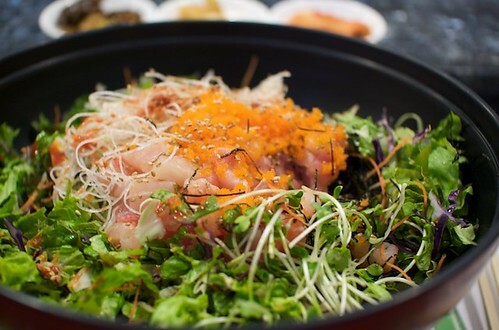 After reading somewhere that the sashimi salad was one of A-Won’s specialties, I ordered one for myself. The waitress promptly brought out three dishes of panchan, a bowl of miso soup and a bowl of rice. 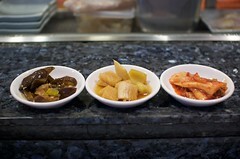 The panchan consisted of an eggplant dish, a radish one, and the ubiquitous kimchi. The kimchi wasn’t anything to write home about and neither was the radish, but I really enjoyed the eggplant. It tasted like toasted sesame oil and packed a garlicky punch. When my sashimi salad came out, I was impressed with the size. It looked large when other people ordered it, but placed in front of me, it was gigantic! The bowl was filled with strips of lettuce, sprouts, seaweed, bonito, and a healthy serving of cubed tuna, salmon, and some white fish. The waitress also brought a bottle of red, sweet gochujang with the salad, so I squirted a bunch over my bowl, mostly on the lettuce and vegetables. Although there was certainly a great quantity of fish, the quality wasn’t spectacular. The tuna tasted alright, but the white fish was so cold that some pieces were actually icy. The salmon was good, but there were less pieces of that than the other fish. Next time, I may just order the chirashi for a better variety of fish. 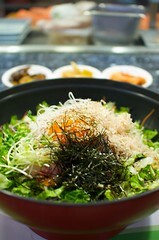 Or maybe the fish egg bowl. My first foray into Korean sushi wasn’t as exciting as I had expected, but I’m not going to let that deter me. Maybe I just ordered the wrong thing. A-Won isn’t too expensive and it’s close enough to home that I can see myself venturing there again to try something different from their menu. There were enough diners in there to convince me that something there is worth returning for.